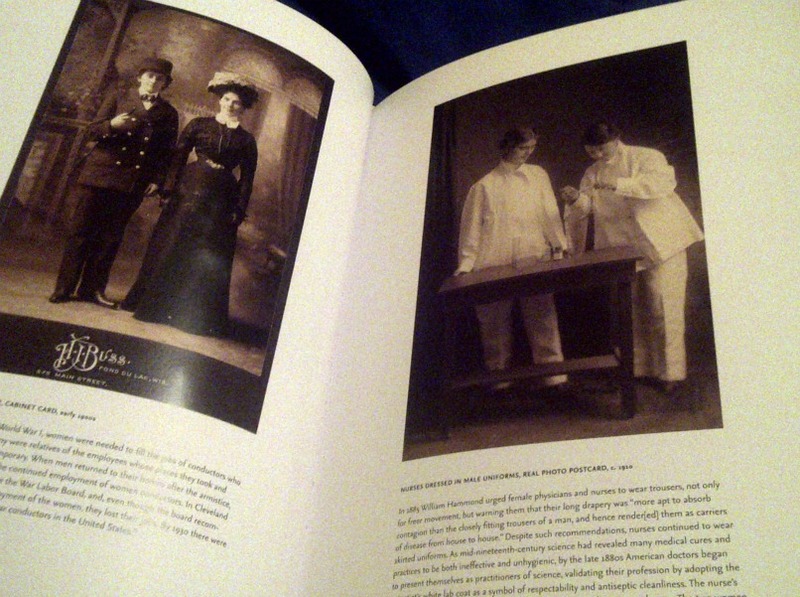 What must be understood about the book is that it is not suggesting that, these women in the photographs provided were out in public walking around in pants on a regular basis. The Introduction alone, makes it clear that the majority of women would have been in conventional female attire of the time when they were outside their homes. Inside, however, they felt comfortable enough to wear pants, dress “like men” and have only the camera as their witnesses. That's what makes it all the more fascinating to look at these pictures – they are mysterious in that they were never originally meant to be seen. The book goes on to discuss all of the different types of women who would have been wearing pants and other garments considered only for men's apparel in years as early as the 17th century in North America. The most obvious and most identifiable types of women to me are those in the 19th and 20th centuries in America who were of working class status, doing the same work as men, and wearing the same clothing. Unfortunately, for single, working class women the options were obviously limited in terms of jobs any time prior to the mid 20th century. Some women would wear men's clothes if only to escape the fate of prostitution and find a man's job. Many women also dressed as men so convincingly, that they were able to seek out positions in mines and factories and in some rare cases, even some such positions as train conductors, fisherwomen, farmers and house-painters – all of which required their employees to wear pants for reasons none other than simple mobility and safety. The other type of fascinating woman I came across in this book was none other than the legit, true cowgirl, found only in the 19th century south western United States. 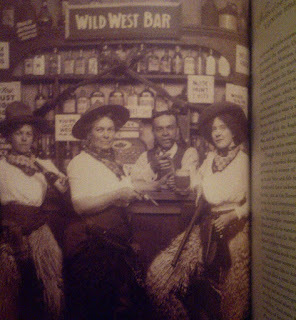 The main character in this American legend is called Calamity Jane, a bonified cowgirl right down to her chewing tobacco. There were plenty of cases such as these, many examples depicted in the book. 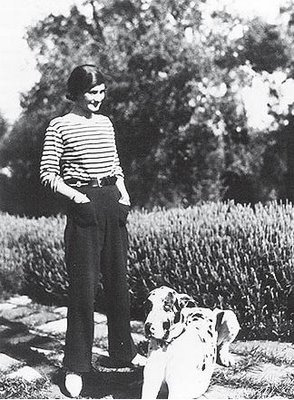 When the Great Depression happened, followed quickly by the hardships caused by the Second World War, it became more and more common to see women in pants going to work in the fields or the factory. Since then, obviously times have changed and the world we live in (here in middle class, big city, North America....) and women have more options than they did in the past in both working life, as well as in fashion. The 40s gave us Rosie the Riveter. 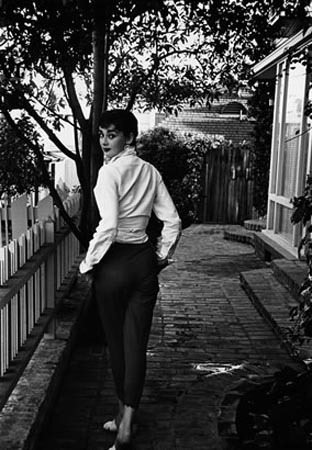 The 50s was a little bit of a step back, but there are still some cases such as Audrey Hepburn wearing clam diggers and dressing like a boy. I've already mentioned Coco, and when the 60s came, obviously all hell broke loose and women everywhere were getting into jeans and stepping away from all possible conventions. The thing about clothes is that they define who you are. Even if that definition is not more than “guy who doesn't care about what he looks like,” (as unfortunate as that may be...) it's still a definition, which has been decided based on the choice of clothing the wearer has chosen for whatever reason it may be. People think fashion design is an unconventional art form, and I agree. Fashion design is more than creating art – it's creating lives.